Hisham Matar’s father Jaballa Matar, an active opponent of Muammar Qaddafi in Libya, was kidnapped in Cairo in 1990 and imprisoned in Tripoli’s notorious Abu Salim jail. After 1996, there was no word of what happened to him. This beautifully written memoir concerns not only Matar’s memories of family life before his disappearance, but also the desperation of those left not knowing their loved one’s fate. Read on Radio 4, the book has received remarkable reviews from (among others) Colm Tóibín and Hilary Mantel. The book is particularly moving on the effect of the disappearance on everyday life. Matar’s mother continued videoing football matches for her missing husband for years after he disappeared. In their exile, Matar and his family do everything they can think of to find out what has happened to Jaballa. At the same time, Matar develops as a novelist, publishing among other things the well-reviewed Anatomy of a Disappearance. After Tony Blair’s rapprochement with Qaddafi in 2004, Matar, who was living in London, notes: “none of us felt safe. Officials from the Libyan embassy attended the first reading I gave from my first novel. A report was sent to Tripoli and I became a watched man. It was deemed no longer safe for me to visit my family in Egypt, which caused a second exile” (p. 174). While the book concerns Matar’s relationship with his father, his mother also stands out as a remarkable woman in her own right. I learnt a lot about Libya’s history from this remarkable book, and its impacts on those who live through it. 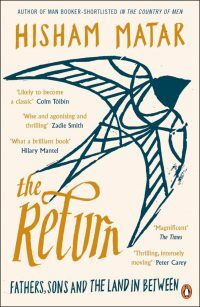 While The Return gives some truly horrendous accounts of human rights violations, it is also a book about deep resilience and love. Novels that are barely novels have sometimes managed to win over the Booker Prize judges: Julian Barnes won for The Sense of an Ending a couple of years ago and Penelope Fitzgerald’s Offshore was triumphant in 1979. (Both are excellent, slender novels that are suited to reading in a single sitting.) So perhaps The Testament of Mary, in which Colm Tóibín enters the mind of the aged mother of Christ over 100 lyrical, heart-wrenching pages, will be named the best novel of the year this week at the 15 October prize ceremony, which takes place just the other side of London Bridge at the Guildhall. The Irish author would certainly be a deserving winner. 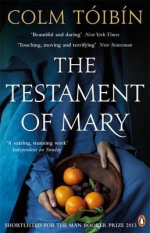 The Testament of Mary is such a rich work of the imagination, you’d have to be Richard Dawkins not to be moved by this depiction of Mary’s memories of her sanctified son and the violence, cruelty and duplicity that encroached upon her daily existence. This is a subtly daring work of fiction, in which Jesus (though his name is never uttered) and his followers are portrayed with a degree of ambivalence by his mother, as she recalls the world-changing incidents that sent her into exile. The Son of God is serenely powerful yet distant with her, and preoccupied during the wedding banquet where his followers claim he has turned water into wine. In the months and years after his murder, these early Christians busily fashion myths about his life, death and rise that confound his mother. His death may have redeemed the world, but for Mary it was the tragedy of losing a son. As she tries to make sense of it all in later life, her account swells with a sadness that is, at times, overwhelming. ‘Memory fills my body as much as blood and bones,’ says Mary. Read this remarkable book in one sitting and Tóibín’s insistent, poignant prose will have a similar effect. The longlist for the Man Booker Prize 2013 is out although several of the selected books are not (update: publishers have rush released titles to meet demand). This year the judges have picked an unpredictable, international list of 13 books for the literary prize and we have them in stock here at the Riverside. Click on the images below for a gallery of the nominees and look out for The Lowland by Jhumpa Lahiri, the final title published in September. The £50,000 prize is awarded on 15 October.